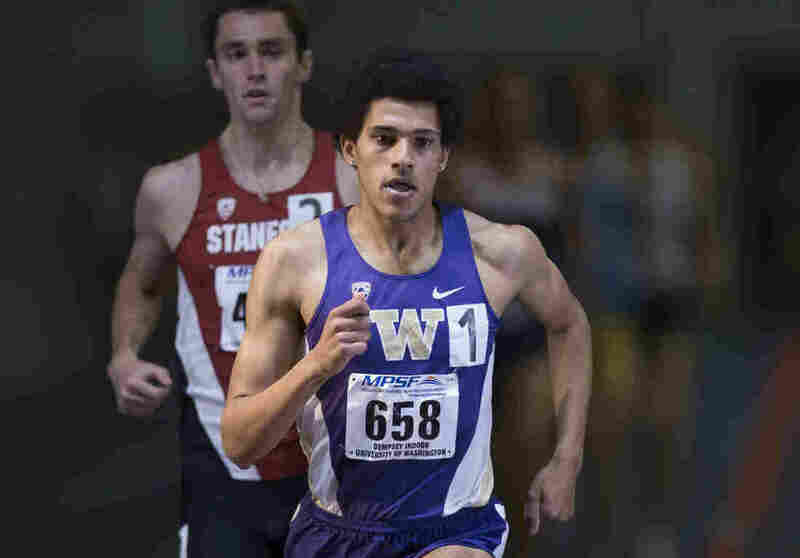 Why Fastest U.S. College Mile Runner Won't Be Vying To Be NCAA Champ The University of Washington's Izaic Yorks ran a mile in 3:53, setting a new mark for an American collegian. But loyalty to his team means he won't be running the mile at this weekend's championship. Izaic Yorks, a senior at the University of Washington, recently ran a mile in 3:53 — the fastest mile of any American collegiate athlete. Here, he competes on Feb. 27 in Seattle. Last week, Izaic Yorks, a senior at the University of Washington, ran a mile in 3:53 — the fastest college mile ever by an American. The effort qualifies him for the Olympic trials this summer. So why isn't Yorks running in the mile at this weekend's NCAA championships in Birmingham, Ala.? Turns out, he had to make a decision: run that mile alone, or run with his team in the distance medley relay or DMR. If he decided to run the mile race, he would have been required to run a preliminary round right before the DMR — compromising his team's shot at a national title. Yorks recalls when his coach, Greg Metcalf, pulls him aside to ask what he thinks about running the mile race. "I was just, no way. I want to do the DMR," Yorks replied. "That's what I told these guys I would do. And I'm gonna stick to that word." "I'm sitting in my office on Sunday, making our declarations," Metcalf says. "And I hit the 'scratch' button next to Izaic's name, next to 3:53, I think, 'Am I the biggest idiot of all time?'" Maybe. But in a sport that so often celebrates individual glory, Yorks is not only very fast, he's also very loyal. Update @ 12:08 p.m., March 13: The UW Men finished second in the DMR on Friday, less than a second behind Oregon.